Still a long way until the OpenNebulaConf 2018 in Amsterdam, however, if you don’t want to wait for so long, you can always attend to one of the TechDays organised all around the globe! Check the official calendar of events here and feel free to contact us if you want to speak and get your tickets. vCenter issues related to disk and network monitoring have been solved. The full list of improvements can be found, as always, in our documentation. If you are curious and want to see the technical details, feel free to glance at the official Github repository. Alongside with OpenNebula 5.4.9 we have made a new release for users using vCenter. All the fixes and improvements on 5.4.9 and more are available in vOneCloud 3.0.5. Download the package at vonecloud.today. Have a look at this blog post for further information. Moreover we have been working in some of the new features for OpenNebula 5.6. The one we are more excited about is the new Lock functionality. With this new tool, cloud administrators using OpenNebula, will be able to lock any resource within the cloud infrastructure (VMs, users, networks, datastores, disks…) We aim to give more control to the users over the their cloud elements. Looks good right? Stay tuned to get the latest news! Let’s see what has been going on around our community. Having a quick look at our forum we noticed the increasing number of contributions, answers and questions of all kind. We want to congratulate all the active members that are sharing their knowledge with the rest of the community. Also we would like to propose a big toast for our Champions and all the users that are acting as ambassadors of OpenNebula on the wild wild internet. If you want to become an OpenNebula Champion, read our introductory page and see all the benefits of becoming a champ! 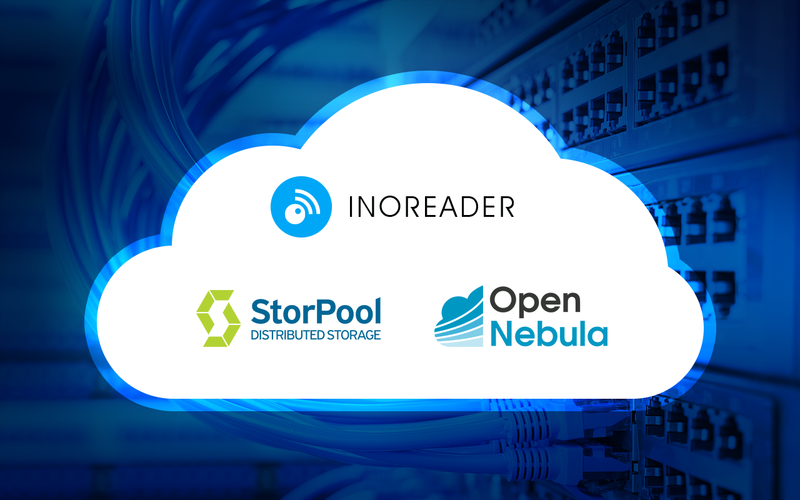 OpenNebula’s community is very happy to welcome Inoreader. They have successfully migrated from Bare-metal servers to OpenNebula + StorPool, which means they now operate on a cloud environment with full control over their resources. Cheers for that! This was an amazing achievement, therefore, Inoreader team has written a very detailed article, describing all the processes, architectures, implementations, installations, integrations and many other experiences happening during the migration. We encourage all of you to have a look at this extensive whitepaper, It is very interesting, simple to read and shows how this migration is possible with OpenNebula. However, if you are a not so experienced user, but still, want to know about this process, do not worry, Inoreader colleagues are preparing a shorter article which we will publish in our blog shortly. Find Inoreader’s article here and enjoy the reading. Moving on, we have a great proposal for Ansible’s github project: add one_vm, one_image and one_service modules to manage VM instances, images and services on OpenNebula cloud platform. As the creator says, they have been using these modules in a production environment for the last 3 months and also the integration tests are working. You can see some code on their github repository. This time Université Catholique de Louvain in collaboration with UDS Enterprise, bring us this VDI platform that makes possible for their students to access virtual classrooms as if they were in the standard computer classroom, being able to use the same software as in their labs, anywhere, anytime and using any device. Follow this link to discover more details on how this was achieved. OpenNebula team wants to thanks Computing For Geeks for making a great tutorial about Installing OpenNebula Front-end on CentOS 7. If you are planning to start learning about OpenNebula this tutorial is a great starting point, anyhow if you find any difficulty or need further explanations, check our documentation and ask for help in our forum. The OpenNebulaConf 2018 will take place in Amsterdam the 12-13 of November. If you want to attend don’t miss the chance to get the tickets with a great discount with the early bird registration. For this event we are glad to present Linbit and SorPool as part of our Platinum Sponsors and UDS Enterprise as Silver Sponsor. If you want to contribute and enjoy the advantages of being a sponsor visit this link and choose the sponsorship program that suits you better. Find our agenda for 2018 here . OpenNebula Conf 2018 is getting closer and we would like to announce StorPool as new Platinum Sponsor. If you want to participate in OpenNebulaConf and meet StorPool and other OpenNebula users and partners, remember that we just recently opened the very early bird registration. Also, if your company is interested in sponsoring OpenNebulaConf 2018 there are still slots. StorPool is a block-storage software that runs on standard servers, alongside applications and builds a shared storage system out of these servers. StorPool is deeply integrated with OpenNebula and is the leading storage solution for building exceptionally fast & reliable OpenNebula clouds. StorPool is faster, more reliable and scalable, compared to traditional SANs, all-flash arrays, or other storage software. One more month this newsletter acts as a brief summary of OpenNebula’s progress. In this newsletter, you will read about new release features, event details, calendar updates and important community contributions during the last month. Remember, the big event of the year will be the OpenNebulaConf 2018 which will be held in Amsterdam at the end of the year. Passes are being sold right now, do not miss the chance to come!. As we prepare our next big jump to OpenNebula 5.6, the team wants to make sure that everything is up to date on 5.4. This is why this month OpenNebula developers have put all the effort on streamlining the current version with the 5.4.7 and 5.4.8 hotfix releases. Of course this is just a summary, you can check the full list of changes in our documentation or in our github. We have been working on Hybrid Clouds, improving Amazon EC2 and One-to-One drivers. With this new One-to-One driver we aim to ease the communication between OpenNebula instances. However, this is just a little leak on what will be available on OpenNebula 5.6. As an open source project an important part of our labor is to maintain and give support to our community. But as the saying goes “He who gives, receives much more in return” and we receive tons of great contributions, initiatives, answers and many other feedback from our community, and this is for us a source of pride! 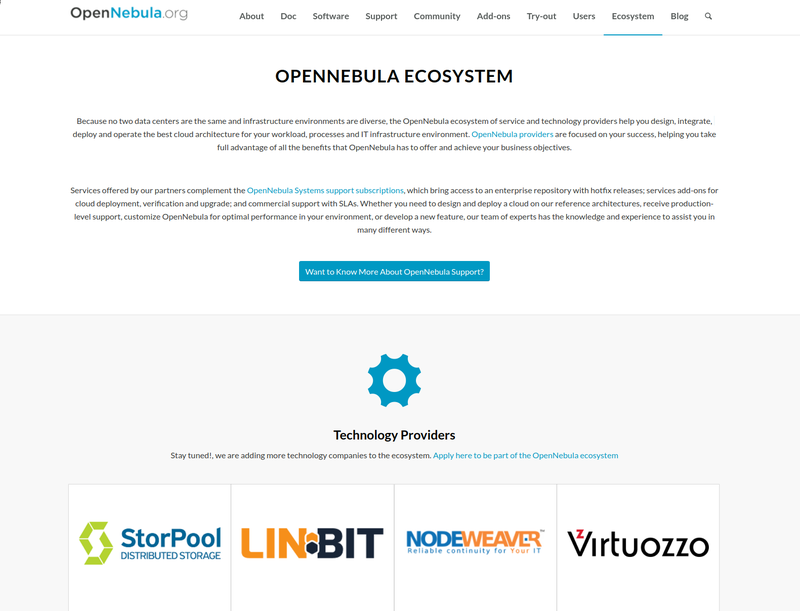 Several companies like StorPool, Linbit, Nodeweaver, Virtual Cable, Virtuozzo and DET-IO have signed in the new OpenNebula Ecosystem. Joining our Partner Ecosystem is a really simple process that you can complete following this guide. It was great to discover, while creating our new Ecosystem how OpenNebula can be integrated with other technologies to provide great solutions. One example is Virtuozzo 7 which will be integrating OpenNebula as an advanced but simple control panel for their infrastructure components. Virtuozzo’s team has made a pretty clear and simple tutorial for installing OpenNebula on top of Virtuozzo 7 which is worth having a look at. A pleasing discovery was the support for OpenNebula 5.x included by UDS Enterprise. They have written an enlightening post explaining the great advantages of publishing virtual desktops on OpenNebula. 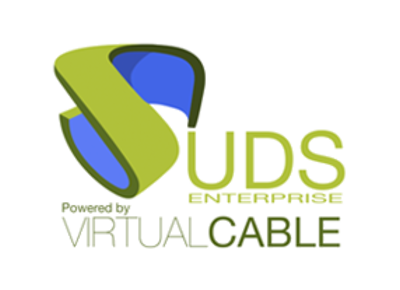 Also you will find an amazing video showing the integration in action, in this video you will see how UDS Enterprise is able to create 1 virtual desktop on OpenNebula every 3 seconds! StorPool team has made a Reference Architecture document describing the architecture of a complete IT infrastructure including storage, computing, networking and cloud orchestration. This document is very complete and didactic.This is why we recommend reading this paper to learn more about different architectures integrating OpenNebula. Another great initiative came to us via twitter, where we saw that the team of runtastic has developed an OpenNebula provider for Terraform. You will find a use example and how to contribute notes on the github repository. Seeing that people are organising some technical meetups regarding OpenNebula, such as the one organised by Computer Port are always great news, this is a good way to teach OpenNebula all around the world and we truly appreciate it. It took its time, and mistakes and more mistakes, and configs and more configs… But finally I have the base for my project up and running. OpenNebula running on the first node! We would like to encourage him and all the users like him to continue with this great job and contribute to our project with their feedback, asking and answering using our forum. To start, just a quick reminder that OpenNebulaConf 2018 will be taking place on the 12-13 of November in Amsterdam. Just a few days ago, we announced the very early bird registration and the Call for Sponsors. Gerhard Sternath, CFO at Linbit, already confirmed their attendance via twitter and in a few days we will welcome LINBIT as our first Platinum sponsor. We are hoping to see you all there, to exchange knowledge and most important, to live this amazing experience and enjoy it. We are excited to present the OpenNebula’s Techday calendar for 2018. Our Call for Hosts was welcomed by many partners and thanks to them members of the OpenNebula team will be visiting Bulgaria, Barcelona, Cambridge, Santa Clara and La Habana. The Call for Hosts is still in progress so if you want to be hosting one of our TechDays you are still on time. Read carefully our information page listing the needed steps. Last but not least, I would like to remark our assistance, one more year, to both editions of the VMworld, where OpenNebula experts will be showcasing the latest versions of OpenNebula and vOneCloud. For dates and detailed information check this link.